Besides, if you’d like a tasty salad that helps bridge the gap from winter to spring, Irish Pub Salad is it. The beautiful bibb and butter lettuces are starting to come into the store in the Midwest around St. Paddy’s Day and might very well be available other places year round. And of course, pretty much where ever you live, you’ll find tomatoes, radishes and red onions year ’round. I came across the recipe quite by accident on Epicurious and made a few alterations. One reviewer from Ireland denied all knowledge of such a salad. The Irish, he implied, traditionally, are not known for being huge consumers of salad. Irish Pub Salad would change their minds! Irish Pub Salad, as it’s known in the States, really a “thing” though. It was popularized back in the day by the Atkins Diet. So it’s higher protein, lower carb, and fits in perfectly with a lot of today’s eating plans. Plus it’s a delish blend of flavors. My guess is the name comes from the Dubliner or Cashel Bleu cheese so often found in the salad. I, of course, being cheap, used a grocery store blue cheese and just pretended it was something better! So Irish or not, if you’re looking for a little something to round out your St. Paddy’s day menu, or just looking for a great salad to jump-start your Spring, here it is! Both the bit of Bleu Cheese in the salad and the creamy, tangy dressing sets everything off in Irish Pub Salad to a tee. I think the dressing in Irish Pub Salad is trying to be a play on Heinz Salad Cream which is a popular dressing in the U.K. Play with the dressing in the recipe if you want, add more or less of any ingredients to taste or a pinch of sugar if you’d like. I’m not a huge fan of creamy dressings but the dressing but this one is just so bright and fresh; so even if you’re normally a “vinaigrette” person, you might just fall in love, too. 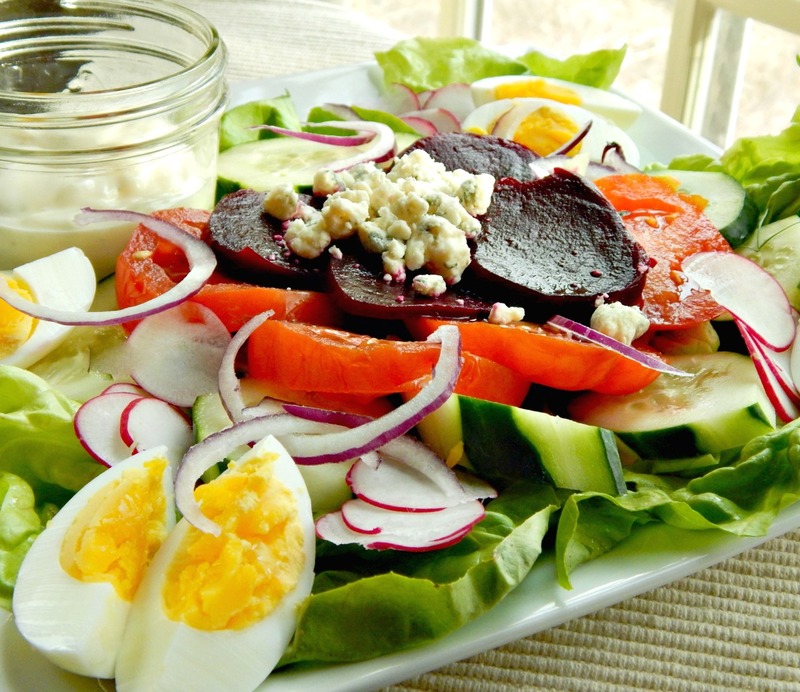 Hard-boiled eggs play a key part in the salad, adding heft and protein. I’m kind of a stickler for a perfect hard-boiled egg – green might be one of the colors in the Irish flag; it has no business in your hard-boiled eggs. For decades I made the classic hard- boiled eggs, see Best Basic Hard-Boiled Eggs, then moved on to Easy Peel Steamed Eggs, now I pretty much make all my Hard-Boiled Eggs in the Instant Pot; see my post for Perfect Instant Pot Eggs. And of course, you can buy your pickled beets (and they’re fairly inexpensive) or make your own Pickled Beets. The pickled beets in this recipe are made from my Irish Grandmother’s One Jar Pickled Beets. They are a beautiful thing. If fresh beets are super pricey, you can pickle canned or jarred beets; they’re pretty good quality but will be a bit softer. A “bun” of Lettuce – a little pricier but this says Spring! You’ll want to pick up condiments like the mayo and vinegar during the Summer Sales when they are so much more inexpensive. If you miss summer sales, many condiments are also on sale right before the Superbowl. Vinegar is an item I shop strategically for (I use quite a bit of it) and try to stock up on just prior to Easter when it is usually at a low. It might look a bit strange if you look in my laundry room after Easter and see multiple jugs but it’s normally at quite a big discount. The flavored or specialty vinegar is usually on sale at the same time, often unadvertised. Stock up on eggs when they’re inexpensive, normally during Holiday weeks. Low prices in my area range from free (often with other purchases) to anywhere from $1.89 for a dozen eggs. Shop Aldi, too, if you have one nearby. For all the talk about farm fresh eggs, eggs last for weeks in the fridge and older ones make better hard-boiled eggs. The date on the package is a ‘buy’ date, and you can expect them to last several weeks past that date. If you pick up two or three packages when they’re at their low, you’ll rarely need to pay full price. If in doubt about an egg, put it in a bowl of water. If it floats to the top, discard. It’s not spoiled (eggs rarely spoil if refrigerated properly) but it will be thickened from the air exchange through the porous shell. This salad contains a lot of different vegetables, but just a little of each. Make sure you have a use for any leftover ones! The lettuce can be a splurge; fancier lettuces like this are generally at cut-rate prices around holidays and may come and go on the grocery store ad as specials. It is ALWAYS cheaper to buy lettuce by the bunch rather than in the bags. Always, always, always, always. 4 to 10 times cheaper. Compare the by the head lettuces priced by the pound to the by the bag lettuces priced per ounce. A tasty salad that helps bridge the gap from winter to spring, full of all kinds of “salad bar” type veggies and topped by bleu cheese and a bright, creamy dressing. Combine mayonnaise, vinegar, tarragon and mustard powder (or Dijon) in a small bowl and whisk to blend. Whisk in enough water by teaspoonfuls to make dressing thin enough to pour. Season dressing to taste with salt and pepper. Add a pinch or two of sugar if desired. Arrange lettuce on platter as the base of salad. Place salad bar ingredients over lettuce in an attractive pattern. Top with sliced or wedged hard-boiled eggs. Drizzle dressing over salad. Place cheese wedges at ends of the platter or sprinkle with cheese and serve. Bibb lettuce, tomatoes, pickled beets, radishes, red onion are a beautiful combination. I’m sharing this Irish Pub Salad at the Novice Gardener for this week’s Fiesta Friday, co-hosted by Jhuls @The Not So Creative Cook and Mila @milkandbun. This entry was posted in Click here for Bargain Meals, Click here for Fabulous Food Posts and tagged Bargain Meal of the Week, Beets, bleu cheese, Cheese, Eggs, Irish, Main dish salad, Salad, Salad Dressings. Bookmark the permalink. I’m getting ready to prepare the Irish Pub Salad but for the life of me I cannot figure out what dressing you’re talking about using with it. I always prefer, at least the first time or two, to enjoy a dish exactly the way its written before I might before changing any flavors to suit me so I’d like to use what you intend here. Hi Pamela, the first 6 ingredients in the recipe form the dressing. I’ll make a note in the recipe so no one else is confused. Going to make this today, but noticed that in the instructions it says “Dijon mustard” but the ingredients says “mustard powder”. Which is correct? If Dijon is correct, then how much? Thank you! I beg your pardon, Heather – mustard powder if you have it or 1/2 teaspoon Dijon. I think I wanted to give the option and forgot to write it in! Hope it didn’t goof you up!! Thanks, Petra! It’s such a nice “ring in” for Spring. Great combo of veggies and love the dressing…. looks delicious Frugal. .. I haven’t seen such ‘Irish’ salad in Dubai’ Irish pubs, but it looks so tasty-at least for me! so call whatever- just love it! 😀 Beets, greens, eggs – for me it’s healthy and super meal for everyday! Yum! Have a great weekend, Frugal! and happy FF! What a yummy and fresh looking salad! Delicious! Trying to find a salad in Ireland is like trying to find someone who doesn’t like Guinness. It has to exist, but it is hard to find. I like the idea of the dressing though. I thought I was getting a salad on the side with my meal once and it was coleslaw! The salad cream is similar to cole slaw dressing. Thanks, Carrie, and by the way, I LOVE Guinness…but I don’t really like most beers. Must be those Irish genes fighting their way out of the slew I have from different cultures! Haha! I had a very good friend from Ireland, who has since moved back home. She taught me to put a dash of salt on my Guinness!